I put this up on my Instastories yesterday and had loads of lovely responses from you guys asking for the recipe, so …voila! 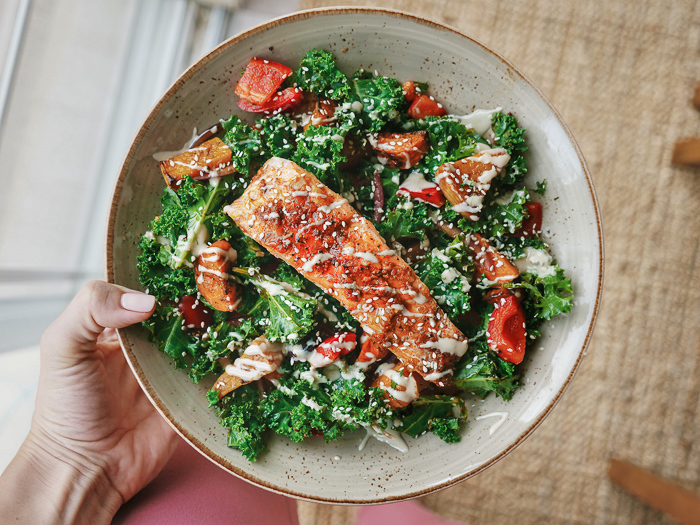 In my opinion, this kale-based salad is the ultimate prepare-in-advance, healthy lunch or dinner. I tend to make the salad in huge batches and marinate 4 salmon fillets at a time in advance, ready for cooking. This recipe, however, is for 2 servings instead to make things easier). A) Well, I love it! C) It goes with almost everything! So whether that’s grilled tofu, poached eggs, or even by itself with a big dollop of hummus and toasted cashews for a fully vegan meal (need to sub the tbsp of honey too)- it’s a winner and I know you’re going to love it like I do! 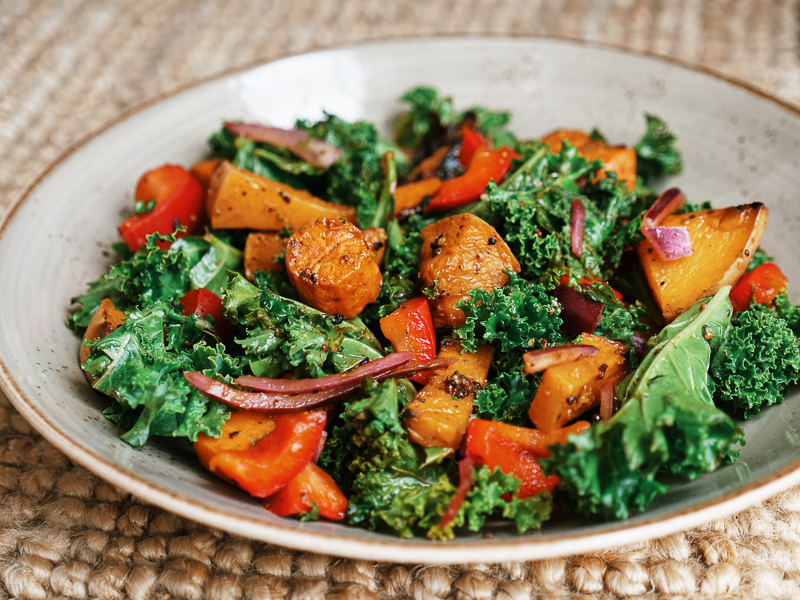 It’s the nicest way I know to eat raw kale (drenched in lots of fresh lemon juice and drizzled with tahini) and the sweet, roasted root vegetables add that ‘substance’ as some might say. It’s basically just a beautifully balanced, filling and healthy meal that can be prepped in advance and kept in the fridge. Cha-Ching! I have broken the ingredients down so that you can make the salad (or salmon) alone if you’d like to chop and change. Please comment below, letting me know what you think of the recipe and if you enjoyed it! 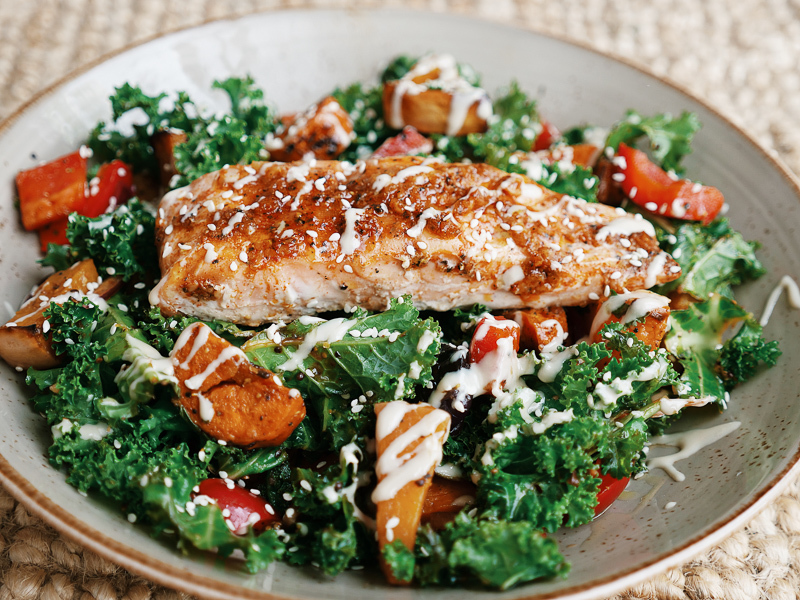 Marinade the salmon by combining all the ingredients together and rubbing it into the fillets. You can either cook them straight away or leave them in the fridge for the next day. 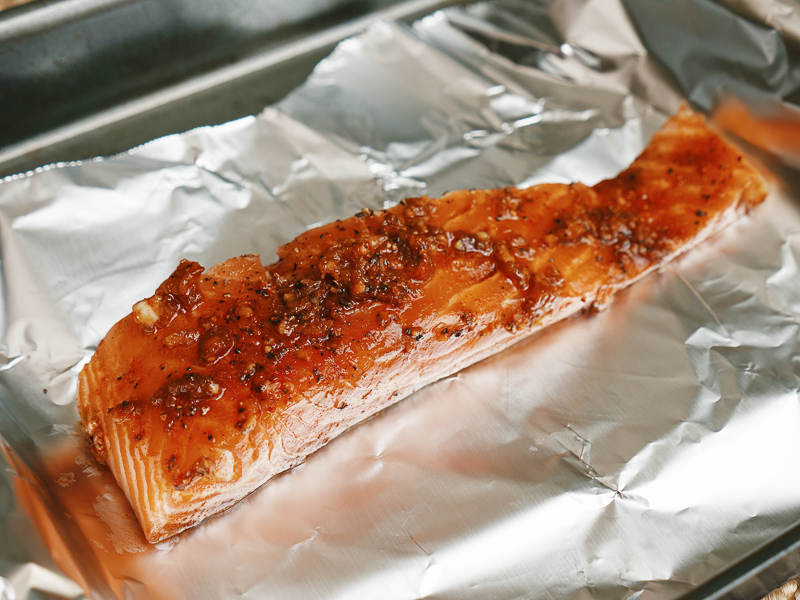 When ready - Wrap in foil and bake for 15 minutes at a preheated 180-degree oven (medium cooked). Remove the leaves from the kale stems (discard stems) and then chop roughly into smaller pieces, place in a bowl. Dice the red pepper and thinly slice the raw onion. Add to the bowl. Add the lemon juice, olive oil, balsamic vinegar, salt and pepper - mix well and put in the fridge. Prepare the roasted root veg by chopping the carrots and squash and red onion into equal sized chunks. (You can keep skin on squash). Add to a roasting tray with the mustard, honey, olive oil, garlic, salt and pepper. Mix well. Roast for 30 minutes until starting to crisp. Add the vegetables to the kale salad and mix.